Our new site highlight our extensive range of TEX’S brand products. This is a site with a difference as it unfolds wonderful mouth-watering recipes utilizing TEX’S seasonings with indigenous Caribbean foods and other readily available ingredients, gift ideas, delicious food photos, recipes and other information. Over the years, TEX’S seasonings have become firmly established on the market and is now enjoyed internationally. The reputation of TEX’s seasonings for their tantalising, flavourful, aromatic and delicious taste have been renowned for over 70 years. Our recipe section showcase dishes which have been tried and tested and include a number of family favourites which demonstrate the versatility of the seasonings in a wide variety of dishes from dips, simple starters to elaborate main meals: eg. lightly sprinkle Tex’s Tropical Multi-purpose Seasoning on chips and savour the difference! Tex’s Seasonings are very tasty in salads and add that ’magic’ flavour to your sauces, dips and are ideal for use in Vegetarian dishes. Used in the preparation of gravies!! GRAVA-LICIOUS!!! 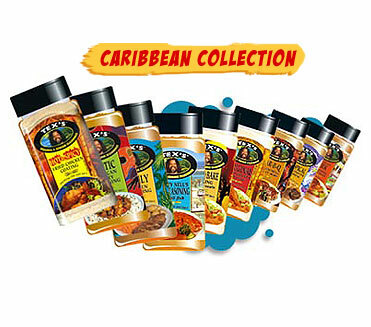 It is a well known fact that the essence of good cooking is the art of seasoning!, therefore, TEX’S seasonings are blended from 19 carefully selected herbs and spices that have a long and historical use in foods which create that distinctive, enchanting and exotic taste to compliment any dish. Our recipe book will introduce your taste buds to the wonderful taste of cooking with TEX’S seasonings. Don’t be afraid to put your own personal touches to the recipes; use your imagination!! make good use of TEX’S seasonings - just add to suit your taste buds! We hope you will enjoy cooking with TEX’s brand seasonings and trying out our delicious recipes. WELCOME!! Thank you for visiting the site whether you are buying for yourself, choosing a gift, sending to a friend or just browsing! NO PROBLEM!! FACT: ACKEE: African name Akye Fufo; scientific name - Blighia Sapida. The ackee plant was brought from West Africa to Kew, Jamaica, by Captain William Bligh in 1793. Captain Bligh introduced Breadfruit on his second visit to Jamaica in 1793. Breadfruit is very versatile and is great for boiling soups, baking, friend and roasting.